Artichoke Plants delivered direct by D.T.Brown seeds. Artichoke plants prefer a sheltered but sunny position and can be grown in a conatiner on the patio. 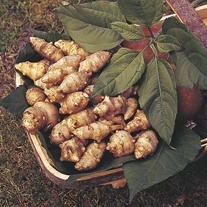 Plant Jerusalem Artichoke tubers horizontally, 4-6" (10-15 cm) deep, 12" (30 cm) apart, allowing 12" (30 cm) between rows. 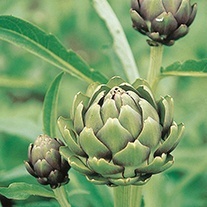 Globe Artichoke plants should be planted allowing 60-90cm (2-3ft). Well drained soil is particulary impotant for growing both varities of artichoke.